I always thought that delectable molten chocolate lava cake that you get in restaurants would be unbelievably difficult to make. This is one of my favorite chocolate dessert recipes and I was delighted to find that it is very easy to make in your own kitchen. Line the bottoms of 4 ramekins or small custard cups with a circle of waxed paper. Grease the ramekins and set them aside. In a medium microwavable bowl, microwave butter (or margarine) and chocolate on Hi power about 45 seconds or until chocolate is melted; stir until smooth. Whisk in sugar, flour and salt until blended. Beat in eggs, egg yolks and vanilla. Spoon even amounts into the prepared ramekins. Cover and refrigerate 1 hour or until ready to bake (up to 24 hours). When ready to bake, preheat oven to 450°F. Bake for 13-15 minutes or until the edges are firm, but the centers are still slightly soft. (Do not over bake) Let cool on wire racks for 5 minutes. To serve, carefully run a sharp knife around the cake edges. Unmold onto serving plates and remove the waxed paper. Dusting the tops with icing sugar makes a great presentation. This chocolate cake recipe with a saucy chocolate center goes by several names. I know it by the term chocolate lava cake, but others refer to it as volcano cake or molten chocolate cake. All of the names are references to the fact that when you break into the individual cake chocolate sauce flows out of it like molten lava flowing from a volcano. If all lava were chocolate sauce I think we’d all like volcanos to blow their tops regularly. I really think you will love this recipe. It is perfect for your next dinner party, for a romantic dinner for two, or an indulgence-filled girls night in. 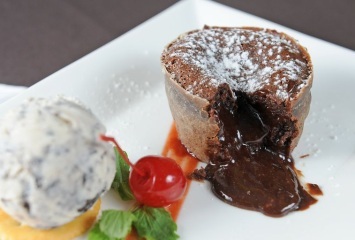 This Molten Chocolate Lava Cake recipe is just one of our amazing dessert recipes. Browse them all here.